In an ideal location close to the quiet fishing village of Morro Jable, the XQ El Palacete sits just in front of the beach and is a short stroll from Jandia where a small selection of shops, bars and restaurants can be found. Virtually bordering the ocean, all guest rooms have magnificent views over the shore. This elegant and sophisticated hotel, with its attentive personnel, will be sure to offer a comfortable stay. Guests will appreciate its beautiful style, genuine personality and comfort. This hotel is not suitable for guests with limited mobility as it is set on a slight incline. The hotel has 54 rooms, 2 floors and 2 lifts. Long trousers for men are requested during evening meals. 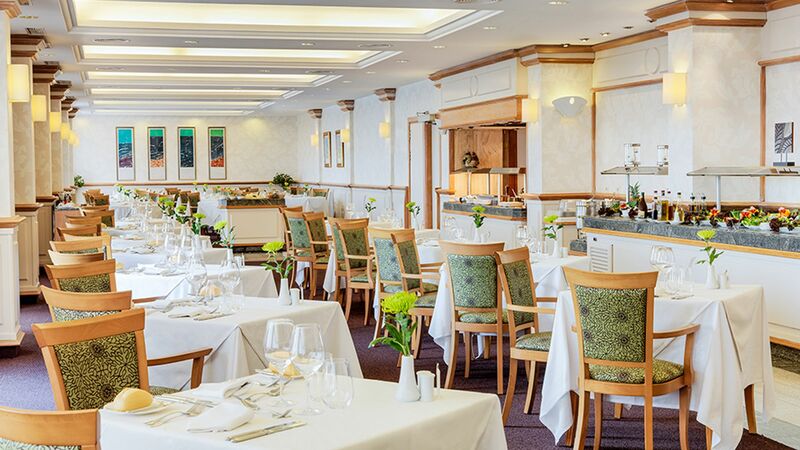 Open for breakfast and dinner serving a varied buffet breakfast with wholegrain products and show cooking, light lunches on the terrace and hot and cold buffet meals and deserts for dinner. There is a special themed buffet evening once per week. A snack bar is also open at lunch time. Guests on a bed and breakfast and half board basis will dine at this restaurant. 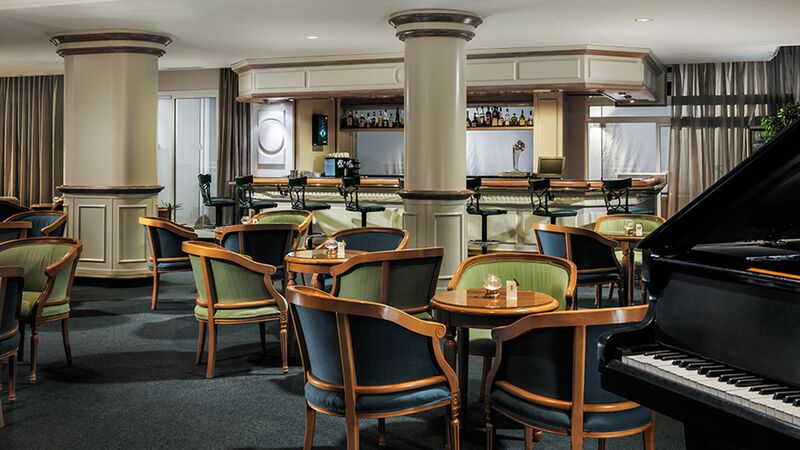 Enjoy evening drinks at the Piano Bar. The Poolside Bar is open all day and offers snacks and refreshments over lunch time. 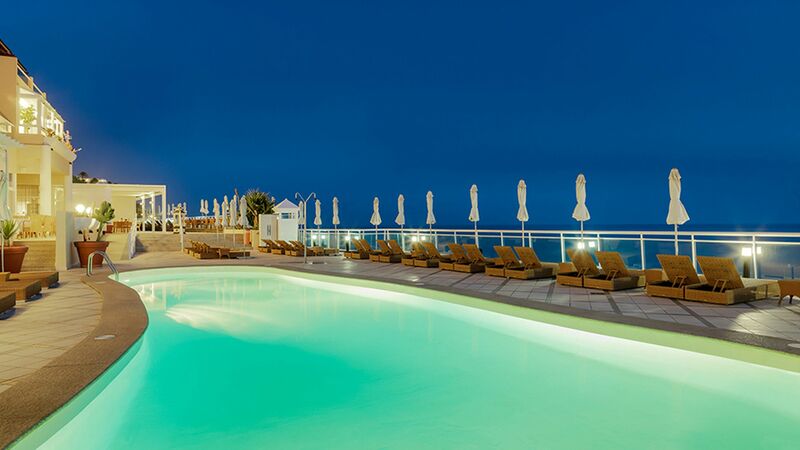 The hotel offer an outdoor heated pool and whirlpool with stunning sea views. The pretty town of Jandia sits along a breezy stretch of coast in southern Fuerteventura. The fabulous white-sand beach is a major attraction - it wraps around the coast and is interspersed with coves and turquoise pools. Sheltered from the wind, the water here is shallow, warm and clear, making it perfect for swimming and watersports. Jandia is one of the best spots in Fuerteventura for windsurfing, and further north, the towering waves attract surfers from the world over and even host the Windsurfing and Kiteboarding World Cup. Jandia's vibrant, compact centre comes complete with outdoor cafes, colourful markets and authentic restaurants, with a cluster along the waterfront promenade forming the heart of the resort's nightlife scene. Flanked by the ruggedly beautiful Jandia National Park, the area is a magnet for outdoorsy types - energetic visitors can hike, bike and hire 4x4s to explore. Twin Full Sea View rooms have air conditioning and a ceiling fan, satellite TV, telephone, minibar, safe (payable locally), bathroom with a bathtub, shower and hairdryer, and a balcony or terrace with sea views. Twin for Sole Use Sea View rooms have air conditioning and a ceiling fan, satellite TV, telephone, minibar, safe (payable locally), bathroom with a bathtub, shower and hairdryer, and a balcony or terrace with sea views. Premier Twin Sea View rooms feature additional benefits such as tea and coffee making facilities, à la carte breakfast on the snack terrace, daily newspaper and complimentary safety deposit box. Suite Sea Views are larger in size and feature a bedroom with double bed, separate living room and a bathroom with shower and hydro massage bathtub. Save up to 10% on the hotel price for holidays between 01 May 2019 - 31 October 2019 booked by 28 February 2019. “ A delightful winter sun destination. British visitors tend to visit the north of the island whist Germans visit the south. XQ El Palacete is in the south. The hotel enjoys a superb position overlooking the magnificent Jandia beach. The approach to the hotel is a little disconcerting as it is not designed to impress. Once inside it is spacious and uncluttered. Our room was on the second floor with a generous veranda and perfect sea views. The room was large and very well appointed, the standard of housekeeping was very high. German is more readily understood that English but Lisa, the duty receptionist, could not have been more welcoming, charming and efficient. We were on a half board basis and both breakfast and dinner were on a buffet service. The meals were of a very high standard with great variety and splendid presentation. Outside there is plenty of room for sun beds on the patios with an attractive swimming pool and a large Jacuzzi. The tendency to pre-book sun-loungers with a towel was a little trying but it seems to b a a national trait.. The staff at El Palacete were, without exception, delightful. Whilst we tend not to visit the same holiday destination more than once we might make an exception for this splendid hotel. .
“ A FANTASTIC HOTEL WITH TOP SERVICE & LOCATION IN THE SUN ! ! We have been coming here each year for several years. We find the place friendly and not too large. The staff know who you are , and are very helpful. The buffet breakfast and evening meal provide an amazing variety of choice. Most of the rooms have been upgraded to premium status, and the only downside to this is that the prices have risen quite a bit over the last few years. And of course the hotel is well situated for access to the lovely beach below.